These were two different pieces that we made in matching yarn (patterns were not part of a set). 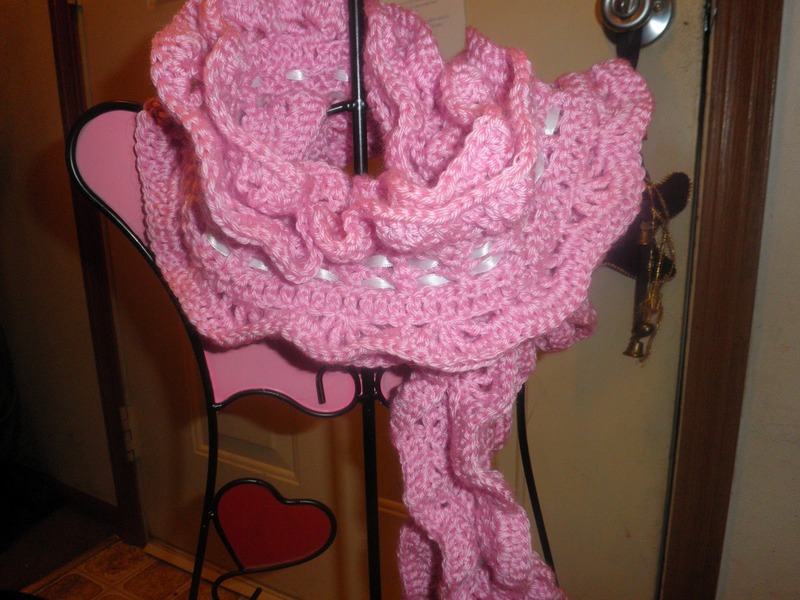 The first piece made was the scarf. 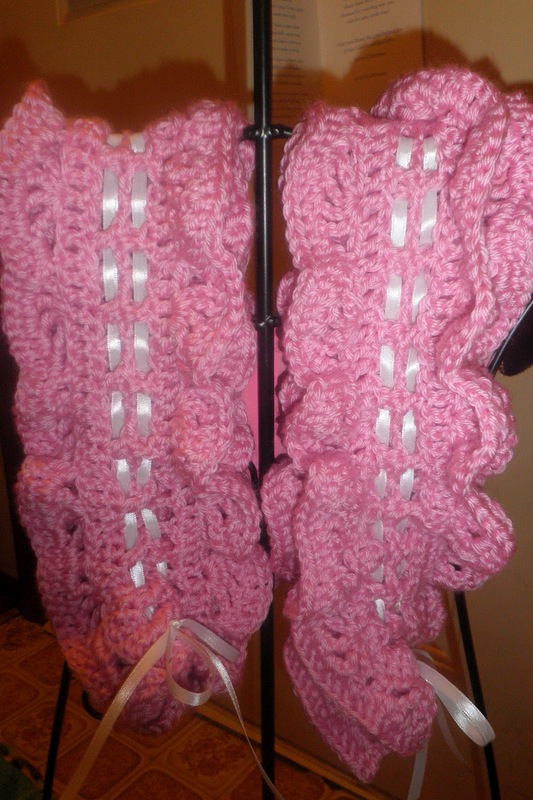 The pattern is called, Ruffled Double Scalloped Scarf Crochet Pattern and can be found HERE. It's $3.99 for the download. The hat, I'm sorry to say is a beanie but I did not get the pattern name written down in my notebook/computer files and so I cannot remember what it was. :( The flower was a separate component and once more, I didn't get the name. I will go look to see if I can find the names for both at a future date. The button I had on hand and the ribbon I purchased at Hobby Lobby, both sizes. Here are some close-ups for you to enjoy! Wow! It's sure been busy around here and I apologize for being a slacker blogger, but once I start getting all the crafts up here, I think you'll understand I've been busy doing and not being lazy, lol. It's spring and that means cleaning, decluttering, crafting, gardening and all kinds of fun things, around here. What have you been up to? As mentioned, there are an abundance of projects I have to share with you all, and will get them up as time allows. Here's one of the most recent. I belong to a group of wonderful ladies who are making doll items each month so they will have an entire set of items to donate to some precious little girl at the end of the year. Most of the things they do are swaps. The April swap was to make a dolly diaper bag for them to put all their handmade goodies inside (and include three 3" prayer squares to go into the dolly blanket). I was so blessed to gift to a new friend, Bekah, and appreciate her sharing her photos with me and the group as well. For this project, I decided to kill two birds with one stone and used a Pinterest pin as inspiration. The original website it came from is Mommy By Day/Crafter By Night and you can read about her inspiration and get the FREE PATTERN for this project HERE! As you can see (after you visit her blog), I made a couple of little changes. 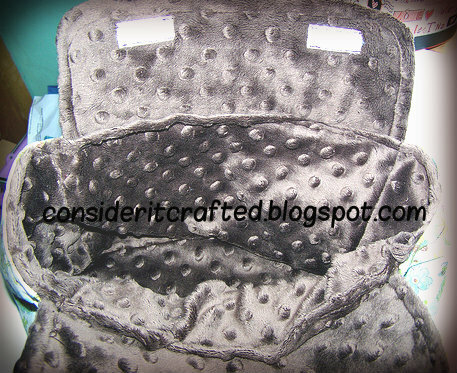 I didn't use fusible fleece, instead chose a sturdy interfacing for the fabric. I also decided to add some fun little pockets. 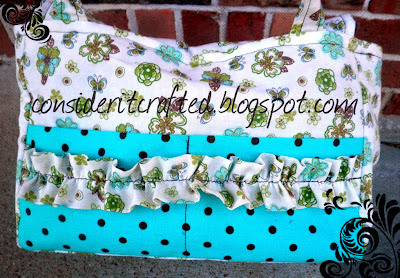 There are two pockets on the front and two on the back (both with ruffle). To make these, I cut 2 pieces of the complimentary fabric in 8x11" size and folded them in half to fit the length. Then I cut 2 extra straps and using a bias stitch, I ruffled them up. I did sew these to the pockets before I attached the panel and interfacing. 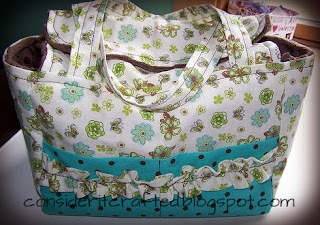 Then when that "piece" was finished, I stitched the lines for the pockets, from top to ruffle, then from ruffle to bottom (so, after I stitched the panel pieces with interfacing, but BEFORE I put all the pieces together to make the bag shell). Here are two more pics to enjoy! It was such an easy project to complete and I hope that if you have "little mommies" in your life that you can find the time to whip up one of these delightful dolly diaper bags. So, keep enjoying your crafts and I hope you can share something soon. I'll have a bunch to share in the near future! A friend of mine is getting ready to give birth to her newest blessing. She knows she's having a boy and so our mom's group at the church had a mini shower for her. While I was not able to attend that meeting/shower, I did send a gift I made. This pattern is called Puppy Dog Hat Pattern and is sold by Sweet Kiwi Crochet. (You can find her blog HERE.) The pattern cost $3.99 and I'm not sure if she sells them off her blog or not, but you could email her if you aren't sure. I have to admit, I already have an earflap hat pattern that I really like and it is my go-to hat, so I debated on the wisdom of purchasing another earflap hat pattern. This pattern is different from the other and gives a different look to the base hat itself. I really like that. And it's easy to do. So, now I have two earflap hats that I enjoy working on. But back to this project. My friend really likes green and though she is having a boy, I thought the green with browns would be so much better for her (I told her that when we chatted this past weekend and she said the green was her choice! LOL). 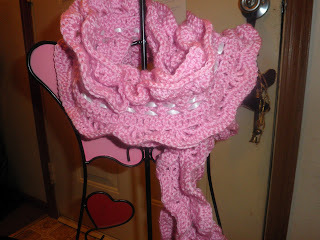 For this particular hat I used Caron Simply Soft yarn for all of the project. The colors used were Bone (for the hat base and braids), Chocolate (for eyes, nose, ears, hat trim and braids) and Sage (for spot and braids). I think it took about 3-4 hours start to finish, but that's because my sewing skills are not the strongest and attaching the little parts takes me a while. The actual crochet work probably only took 1-2 hours. 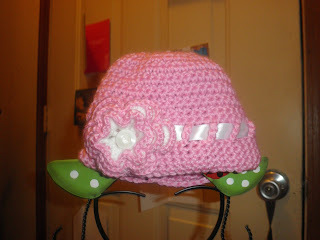 This particular hat was "newborn" size, but the pattern comes with sizes from newborn to 4+ years of age. Hope you all had a fabulous weekend and were able to enjoy your time with loved ones. We had one of our typically-busy weekends but managed to find some down time to watch a movie together (The Wager, starring Randy Travis). Well, as part of getting back into the usual swing of things, I'm hoping to post my weekly craft goals on Mondays. Would also like to hear what you are working on for the week so be sure to leave a comment and let me know. This week there are a few "events" that will require some crafty-goodness. Monday we are supposed to attend a party with our homeschool co-op (if the weather allows). Tuesday is Vday and even though we don't celebrate it in traditional ways, I have some plans to do fun things that will reinforce our parenting class. Saturday is a day-long crop for the scrap group and I try to do something special for those days. As you can see, very busy week. Should be a fun, if somewhat busy week. Better get to sleep. Okay, before I show the final product you are probably wondering why in the world I would make a sock-rose bouquet for my MIL for Christmas. It was an interesting experiment, for sure. And while they don't look exactly like rosebuds, they came out fairly nice, and she liked it which is the most important thing! The only problem now? She says she doesn't/won't undo the socks to wear them! Granted, she might change her mind once August rolls around and all of her fancy socks have been "borrowed" into never-to-be-seen-again land! Haha. 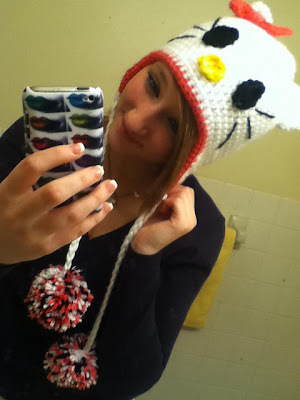 Here is one of my many beautiful nieces, and she is modeling the new Hello Kitty Earflap Hat I made her for Christmas. The pattern for this hat was created by Jessica Teal and cost $3.99 (and included sizes newborn to adult). 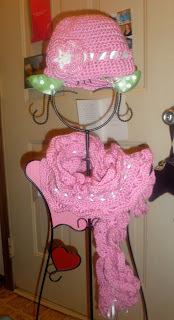 Materials Used: I used double-strands of Caron Simply Soft in White to make the hat base. I used an "H/5.0mm" hook (Boye). 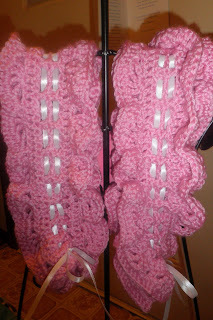 The trim and bow look red in the photos, but I actually used Watermelon (Caron Simply Soft) which is a hot pink. For the eyes I used black in I Love This Yarn! by Hobby Lobby. The yellow nose is just some scrap yarn I had on hand. To make the pom-poms, I used Clover pom-pom makers (the large one). I did make the eyes a little more "oval" than the pattern called for. I didn't keep track of how long it took to make, sorry. And that's one of the goodies I have to share with you. Keep an eye out for more, soon! Hi, everyone! So sorry for the long delay. I've been considering the things in my life and thinking about how to proceed with many of them. This blog, obviously, is one of the things that will remain. My goal for this blog is to share some of the things I make and hopefully inspire you to create and have fun as well. As a part of that goal, I'd like to make at least one post a week. Some weeks maybe more (like the near future when I have a bunch of Christmas goodies to share). But there may also be times when I don't put anything up at all. Please know that I'll resume as soon as I can.